Whether you’re hiring an assistant or building a team (or an expansion team), your challenge is the same as everyone in leadership: How to recruit the right people for your team. So, here’s the rest of my list. What did I leave out? Why are we selecting so many who fail to make it in real estate? There are the agents that fall over at the first objection (and there are many, even though they tell us they’re tenacious!) We keep beating our heads against stone walls recruiting agents who are deficient in the two skill sets we say are most important to real state success: technical (computer) skills and sales skills. We hire them, and then we pour thousands of dollars down a black hole trying to train them to do the things they won’t or can’t do. Why not hire agents who already have technical and sales skills? In my program, The Complete Recruiter, I ask managers to make a list of the skills and qualities they feel are critical in the agents they hire. Please do that. Then, create questions that bring out whether an agent has the skills and qualities you need. Well, it’s not really an interview process to most managers. It’s actually a talk marathon, where the manager talks to the would-be agent until the agent gets tired and agrees (or not) to join the company. That’s what dozens of agents have described as their “recruiting interview”. Here’s the right balance for the first interview: The candidate talks 80% of the time; the interviewer talks 20% of the time. What are you doing while the interviewee is talking? Asking questions and listening. What are you listening for? Whether or not that interviewee has the necessary amounts of the skills and qualities you want. How do you assure you’ve got the complete story? Probe around that one idea until you’re completely assured that the interviewee has sufficient strength of that trait or skill. 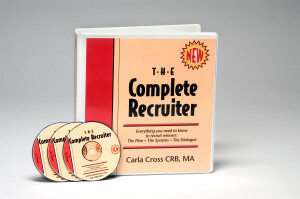 The Complete Recruiter has lots of tips on mastering sales skills for recruiting. This is just one of them. That’s simply because the manager didn’t ask good questions at the beginning of the process. If he had, he would’ve discovered what needs the agent wanted met. Then, he would’ve designed his presentation to meet those needs. A few years ago I was the head writer for the CRB (Certified Real Estate Broker) People Management course. This course includes recruiting, selecting, training, and motivating agents for high productivity. I was excited to teach the course the first time, and was thrilled that there were about sixty managers in the course. I found that most of them had been in the business over ten years. I wanted to create something where they could share recruiting experiences and a wins, so I decided to do a little contest for best recruiting campaign. I introduced the contest the first morning, and waited for the entries. There were none. At the beginning of the second day I asked the students if it was a dumb contest, or what seemed to be the barriers. They told me that none of them had a recruiting plan, much less a campaign! How could you implement your recruiting moves without a plan of action? We pound into our agents heads the idea of business plans. Yet, we dona’t have plans for the most important of all our activities–recruiting. If you’re among the 95% of managers who don’t have a plan, I’ve provided a simple, straightforward method of planning in The Complete Recruiter. You’ve interviewed the agent. The agent doesn’t join that day. Now, what happens? In most companies–nothing! You need a contact management system. You need a contact plan. You need materials, and you need strategy. Finally, you need someone to run that plan. Hire a competent assistant and let that assistant engage your plan. This agent follow-up is really a part of your overall recruiting plan. You expect your agents to do it, and you need to do this, too, with your potential recruits. Remember, follow up until they buy or die! It doesn’t take a masterful recruiter to win all the awards. All it really takes is determination and persistence. And, when you look at the few managers who actively recruit, you know that merely taking a stab at in a consistent manner will win you many recruits. Start now! How is your Recruiting Plan Working? Well, shall we be honest? You probably don’t have a plan. At least, that’s my experience in training and coaching thousands of owners and managers. If you don’t have a plan, how do you know what to do each day to find, select, and recruit those you really want? How do you measure how you’re doing? 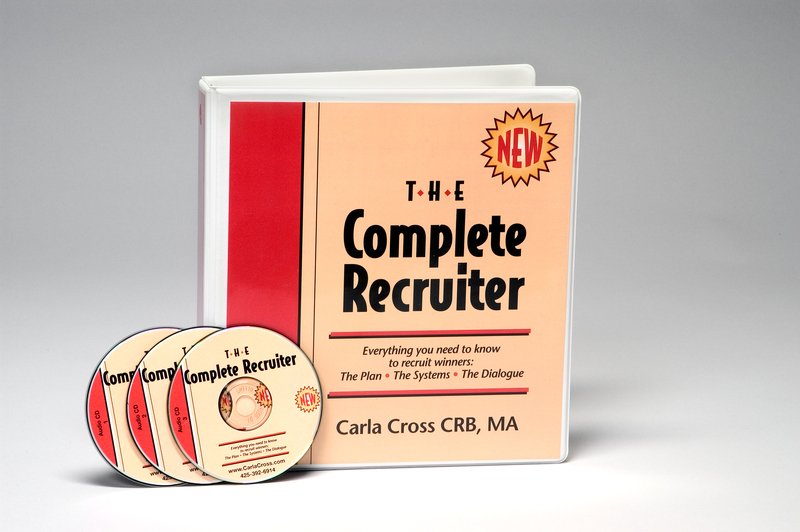 The Complete Recruiter has it all: the plan, the dialogues, the systems. Get it this month at a blazingly good price, too! Find out more here. Leaders with teams: Here’s how to avoid these 5 recruiting mistakes. If you’re trying to create or expand your team, you’re now in leadership! So, you have to grab the skills leaders use to create great teams. Isn’t it amazing the number of things a new team leader is supposed to be able to do from day one, even though he or she isn’t trained to do those tasks? Take recruiting, for example. As As a new manager, I was expected to lead generate, get appointments, ask great questions, and select agents who would be successful. But, did I have the skills to perform those tasks with competence? You can bet not! Even though I was a top-producing agent, I didn’tt take the time to think through, and didn’t know how to, apply the sales skills I had used to attain high sales volume to the recruiting tasks at hand. So, I, like thousands of other new managers, just did it allby ear! Along the way, I had some wins and lots of losses. Through my observations of myself and others, Ia’ve created a list of ten top mistakes, so that you can avoid the pitfalls I and others without training have fallen into. In this blog, we’ll look at the first five. Also, I’ll add some advice I learned from all those mistakes! It should occur to us that we need to sit in a quiet place and think about the kind of people we want to hire before we dive in. But, we are so thrilled that someone is in front of us that it doesn’t occur to us that they bring with them their values and ethics. So, if we haven’t thought out our values, our beliefs, and our perspectives first, we run the risk of hiring people who will then dictate what the company values become. Before you start interviewing, decide what you will and what you won’t stand for. Write out your values and your beliefs. Then, when you interview, check to be sure that agent carries those same values and beliefs into your office. Someone’s got to be the leader, and it better be you! Values: Does the company/your team have values and beliefs that the agent can live by and agree with? Focused on success of its agents: Does the company focus its energy on the success of the agents or on itself? If you are still trying to recruit to an old-style dictatorship, or, if you’ve given up leadership. Find out what participative management is all about. Find out how to build a team. Figure out how to help each agent reach his/her goals. Now, you’re on the right track. Re-tool your business structure so you’re attractive to the entrepreneur of today and tomorrow. “Our company is the largest around.” Well, guess what? If you’re a branch manager, and all your branch managers say the same thing, you’re not going to differentiate yourself that way! You must make yourself a magnet. What about your background provides a benefit to a new agent? To an experienced agent? For example, I was a musical performer and teacher. That taught me performance skills, and how to teach others performance skills. You can see the benefits to agents. I’m able to help an agent reach his goals through greater skills. “We have a great training program.” So says every company out there. What’s so great about your program? You’d better be able to tell ’em and show ’em. For example: “Our training program has a 90% rate in our agents making a sale in the first thirty days they’re with us.” No one else in the area has success figures like that. Here’s the brochure about our program. It spells out the comprehensive five-step program for new agents. Do you want a program that assures you make money fast? We in the real estate industry just love to hire agents through the bidding wars. We either provide a lower desk fee, better commission splits, or more trinkets and trash. Guess what? That’s the chicken’s way out. In reality, price is never the best recruiter. But, if you don’t have a great company organization, if you don’t help agents meet their goals, you’re going to have to compete on price. It’s all you’ve got. Now, work hard to provide real value. After all, consumers pay 10% more for products and services they believe are of quality. Recommendation: Read Drive–The Surprising Truth about What Motivates Us, by Daniel Pink. The motivators have changed, but no one has told real estate professionals! So far, what have I left out? How do you assure you find and hire the right team members? You work so hard to gain those interviews. But, do you have planned interview process that assures you pick winners? (And assures the candidates are impressed with you….) Your Blueprint for Selecting Winners, with new information about what desired agents of today are looking for, is a guide to create your unique attractors, how to put together a powerful presentation, and a completely new video showing exactly how to craft the best ‘crystal ball’ type of questions. Learn more here. Here’s how to avoid hiring the agent or staff from hell! Let’s be honest. Have you ever hired someone and found out it was the ‘hire from hell’? If you haven’t, you just haven’t hired enough agents or staff! Many leaders of teams tell me that the hardest thing they have to do is to hire staff. I think that’s because most of us never had any training in how to hire staff (or hire agents, for that matter). During a 3-day management symposium I taught in South Carolina, and one of the attendees emailed me: “Can you give me some tips to assure I don’t make a hiring mistake with staff? If any of us hasn’t made mistakes hiring staff, please comment! I know I’ve made many–and that’s why I’ve developed the tips here. This tips work for hiring agents or staff. And, they work for agents hiring team members. (Managers: forward this to your agents who want or have teams). So, here are four surefire tips for you. Using that job description you created (you did create one, didn’t you?) for your agent or staff position, create past-based questions that tell you if the candidate has the skills and qualities you need. For example. You’re looking for someone who cares about the company. Here’s the question: “In your past jobs, give me 3 examples of how you watched out for the company’s best interests.” Listen and probe. Here’s an example for hiring agents. Let’s say you want an agent who is a ‘self-starter. The question: “Was there a time in your past when you wanted something badly, and you went out and got some kind of job to earn it?” Listen and probe. 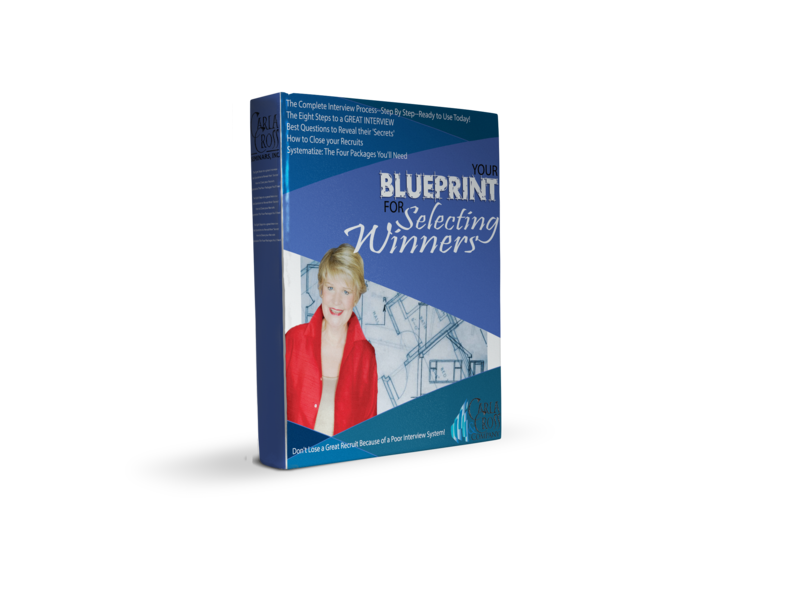 For more information on behavioral predictors, see The Complete Recruiter and my eBook on interviewing, Your Blueprint for Selecting Winners. Most of us don’t interview; we, just sell. We don’t find out the ‘secrets’ about the candidate, but, the candidate sure finds out about us! 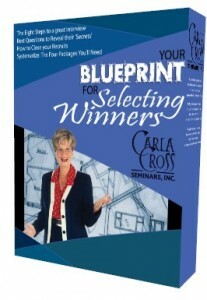 If you need a proven process, see Your Blueprint for Selecting Winners. I created 8 steps to use each time for a smooth, professional interview. I’d also suggest you use a behavioral profile, for those who pass your first interview. Use it to gather information prior to your second interview. In our coaching company, we use Michael Abelson’s: www.abelson.net. It’s well worth it because you find out things that are very hard to discover in the ‘live’ interview. Then, you go back and ask more past-based questions about those areas. That’s called ‘validating’. To be legal: Be sure to follow the same interview process for each ‘candidate’. Be sure to check references–not just the ones the candidate gives you, but go ‘3 deep’. That means to ask the people the candidate gives you, ‘Who else could I contact about this candidate’? Go 2 people deep from each of the names the candidate gives you. That way, you’re sure to get a better, less biased picture of the candidate. You’ll find you learn a lot from people who weren’t ‘direct references’! Now, you have those four surefire tips to avoid staff hiring mistakes. Let me know how they work for you! Here’s how you can do what you thought you couldn’t — straight from Mr. Rogers. First, who was “Mr. Rogers”? Best known from his children’s show, which ran from 1968 to 2000, Fred Rogers was so much more—a minister, a musician with a degree in music composition, and chief puppeteer of his show. I’ve always enjoyed his quotes, because many of them are from his experiences as a musician (as am I). I don’t know about you, but I got bored selling real estate after about 5 years. All those split levels started looking the same! So, let’s say you’ve mastered what you do (and maybe have become bored with the routine of your life!). Then, what do you do? How about doing like Mr. Rogers did: Shine your light and talents outward to influence others in positive ways. Big question: What have you been doing that you can use to contribute to others’ success or life enrichment? How about making a goal for this year? It would make a huge difference in others’ lives—and yours! Note to managers, trainers, and coaches: Do an exercise where each person names a talent/skill they have. Then, have their partner ‘translate’ how that skill can be translated to others. Example: “People tend to tell me their secrets and their fears.” Partner: How about gaining some coaching expertise and start coaching to help people? Let me know what you come up with. I’ve found that it’s easier for someone else to be creative about your talents and skills that it is for you to be! Here’s to a very fulfilling, rich, and contributive year! Check out Up and Running in Real Estate, my online training, coaching, and accountability plan with an amazing, results-centered business start-up plan. You will be getting further faster (and I’ll help you!). Check it out here. Want Extra Support? What About Getting a Mentor? Joining a Team? Want extra support? What about getting a mentor? These are questions newer agents, especially, ask themselves. These and dozens of other considerations are in my ebook, What They Don’t Teach You in Pre-License School. So, what about getting a mentor? Here are the pros and cons. New agents love the thought of a mentor, because they have so many questions. And, they think the mentor will be their ‘answer man’. But, I’ve observed that having an ‘answer man’ surely doesn’t guarantee success. In fact, it may impede an agent getting into action. How? An agent may think he needs more and more information before he will act. Then, he just keeps coming to the mentor for every question under the sun. And, the more the new agent knows, the more frightened he becomes. Plus, the advice received from the mentor may not be in the new agent’s best interest. Here’s the question to ask yourself: Why is the mentor willing to help you? What does the mentor expect from you? Another consideration new agents have is to join a team. As you interview, you may be invited to join an office team. That means you’ll be essentially working for a ‘rainmaker’, a lead agent who generates ‘leads’ for those on his team. Of course, those leads cost money, and the rainmaker takes about half the income from the team member for the lead generation and other services. Team Leaders Generate Leads for Team Members–but There’s a ‘Catch’…. Teaming helps agents obtain leads as they start up business. While agents earn the most in commission dollars when they generate their leads themselves, a new agent may need to pay for someone else’s lead generation to begin to develop business. There is a downside to this approach, how­ever. Agents can become complacent and sit and wait for leads. They won’t generate—until they get tired of paying for someone else’s leads. Positives: You may be able to jump-start your career with leads given to you. Watch out for: Be careful to choose a rainmaker who really has enough good leads to distribute to you. Sit in on her team meeting to see how she manages the team. Find out if and how the rain­maker will train you. Find out how much turnover there has been on the team. Find out whether you can sell and list houses outside the team—and how much the rainmaker would charge you if you did. Read the contract the rainmaker asks you to sign and be sure you understand the consequences of your involvement. Evaluate how good a leader that rainmaker is. Some rainmakers are great salespeople, but lousy leaders, and so their team never ‘gells’. Most team leaders ultimately expect their team members to generate their own leads, in addition to team leads. If you can’t meet the rainmaker’s expectations, you are terminated. Be willing and ready to take the responsibilities of team member seriously. Be informed: Be sure to get the services and responsibilities, plus the commission structure of the team–in writing! What experience have you had? Let me know, so we’ll add your comments to my advice! Breaking up the monotony–teaching with creativity. Do you sit in class and dread the experience because the instrucftor just drones on? Here’s a way to avoid that. So, if you don’t teach yourself, pass on this blog to those that do! If you teach: Do you know the process to break people into small groups and run a successful small group exercise? In less than 2 weeks, I’ll be doing my unique version of Instructor Development Workshop. * (May 22-23 in Bellevue, Washington). One of the most challenging, yet most effective teaching method, is using small groups. These can be task force, case study, and role play. I say ‘most challenging’, because these small groups frequently go wrong. Why? Because the facilitators don’t know how to organize, run, and summarize them correctly. So, recently, I added this 12-point checklist to use to assure your small group exercise will go as you want it to go! Grab the 12-point checklist at the end of this blog. *This course fulfills a qualification for you to teach clock-hour approved courses in Washington state, and it includes 15 real estate clock hours. Why Not Just Talk Your Way Through your Class? In a word–because it’s boring! Today, more than ever, your audience won’t focus on you and your droning lecture for more than 10 minutes. So, you’d better change it up with various teaching methods. In my Instructor Development Workshop, I demonstrate several creative methods. We try them out, and then you try them out in a sample teaching situation. Rather than ‘winging it’ by trying out these methods on ‘real people’, you have a chance to watch me and then take part in several teaching situations. Another new feature I’ve added to my Instructor Development Course is more application of these teaching methods to your course. Unfortunately, most courses aren’t written with instructor direction. In fact, they’re not even written as courses. Instead, they’re ‘streams of consciousness’. It’s very hard to take all those words and make them into a teaching course! So, I now have you bring a module of the course you want to teach–or are teaching–to our Instructor Development class. We spend some time deciding which teaching methods would fit into that section of your course. You walk away with a much better grasp–and concrete skills–to make that course come alive! Even if you’ve taken other instructor development courses, I promise you’ll get new strategies–for teaching, for presenting, and for course creativity. Plus, we have a lot of fun doing the course, too. Grab my 12-point checklist for running those small group exercises here. 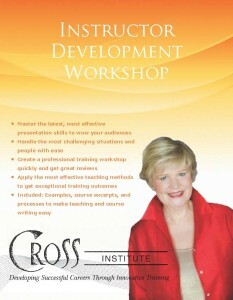 Join Me for Instructor Development in May! Why not polish your presentation, teaching, and facilitation skills, gain 15 clock hours, and have a great time at it? I’d love to work with you to do all these things. Click here for more information and registration. See you May 22! Here are three tips to present more effectively. Managers, trainers, salespeople, and even ‘real people’ present frequently in front of one–to hundreds of people. Unfortunately, most presenters (yes, you become a presenter when you’re selling! ), aren’t trained with the best presentation tools. Instead, they just ‘wing it’. So, we in the audience (or your clients) are frequently bored silly. It doesn’t have to be that way. Take a look at the three tips—tips I’ve learned first as a musician, then as a speaker, in front of hundreds of people. These tips will make your next time in front of a few –or many—enjoyable, memorable, and equally enjoyable for your audience or client. Don’t lecture for more than 10 minutes. Adults just don’t have that long an attention span (too much on our minds!). Change it up. Use various “alternative delivery methods”–methods to teach other than lecture. In my Instructor Development Workshop course, I help students learn these teaching methods by modeling them so they can observe me teaching. Then, we de-brief on what we did. Finally, each student teaches a short module using creative methods, and the rest of the students provide feedback. (We really only learn when we do something). Doing greatly increases confidence–and competence. Question: If you’re in sales or management: Are you talking through your listing or recruiting presentation because you know a lot? How long will it take until the person in front of you gets ‘glassy eyes’? Tip: Break up those long-winded monologues with questions and/or tasks for your clients to accomplish. Prepare students or your clients to learn something new. For example: Use a ‘true-false’ or ‘multiple choice’ to start the presentation, or to check learning. I do this in my Instructor Development Workshop course in the middle, and ask students how they would have answered at the beginning of the course–and then contrast that with their new perceptions and learning. It creates lots of ‘ahas’ with them, and further cements their learning experience. Tip: If you’re in sales: Use a fun true-false survey for sellers to use prior to meeting you. It can have lots of fallacies and misinformation, and will set up your presentation to help sellers get the real facts and make the best decision for them. Quit Relying on the ‘Screen’ to Talk for YOU!!! 3. Don’t just read from the PowerPoint on the screen (and, just as onerous, provide the student with the PowerPoint as the “outline”.) If an instructor does that, I feel I want to just take that outline and leave. I can read, thank you! Too many presenters/trainers rely on PowerPoint to do the teaching. Instead, invest in a ‘pointer’ that allows you to make the screen blank. Remember: YOU are the presenter, not your Powerpoint! Tip: If you’re in sales or management: Don’t just drone on from your presentation manual. (that’s your Powerpoint in this instance.) Instead, Use questions, handouts, pauses, and summaries to give your presentation contour and interest. Effective presenting is much more than just talking. It should be creative. Use all the “attention strategies” at your disposal (that means to get them into your repertoire). Use props, stories, various audio-visual aids, and handouts to control the audience “contour”. I learned this as a musician playing for dancing. You direct how you want the audience to dance by the music you pick, and you ‘contour’ the whole experience (slower to faster, then back to slow). As a great instructor/ facilitator/presenter, you can direct your audience (clients) in an awesome learning experience. It just depends on the skills you bring to the table. Tip: Adapt your creativity to your presentation to clients. They’ll appreciate your innovative approach and you’ll become memorable–not just another voice! Most presenters/trainers aren’t in it for the big bucks (where are those big bucks, again?). They’re in it to assist others. Gaining and practicing presentation skills helps us give back better. The bonus: Deep appreciation from our audience or your client. We’ve even been known to change lives for the better! No amount of money can provide that sense of accomplishment. Carla’s next innovative Instructor Development Workshop is coming up May 22-23, 2018 in Bellevue. Washington. Click here for specifics. Take a look at Carla’s comprehensive training resource, The Ultimate Real Estate Trainer’s Guide, and her presentation resource, Knock Their Socks Off: Skills to Make Your Best Presentation Ever. See all her coaching and training resources at www.carlacross.com. Do You Know the Benefits–and Downsides–of Teams? Here are benefits and downsides of joining a team–from a new agent’s perspective. 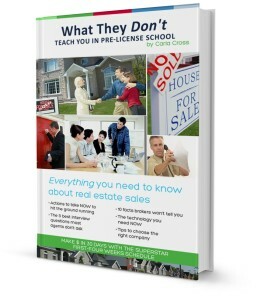 This blog is excerpted from my ebook, What They Don’t Teach You in Pre-License School. I wrote this eBook to save prospective agents and managers time during the interview/selecction process. Here’s an excerpt from the eBook, where I discuss teams–the good and the negatives–for new agents. As you interview, you may be invited to join an office team. That means you’ll be essentially working for a ‘rainmaker’, a lead agent who generates ‘leads’ for those on his team. Of course, those leads cost money, and the rainmaker takes about half the income from the team member for the lead generation and other services. Sit in on her team meeting to see how she manages the team. Find out if and how the rain­maker will train you. Find out how much turnover there has been on the team. Find out whether you can sell and list houses outside the team—and how much the rainmaker would charge you if you did. Read the contract the rainmaker asks you to sign and be sure you understand the consequences of your involvement. Evaluate how good a leader that rainmaker is. Some rainmakers are great salespeople, but lousy leaders, and so their team never ‘jells’. Generate your Own Leads, too? Are You Making the Best Business Decision for You? If you’re interviewing , you’re getting lots of information–sometimes conflicting information. Check out my ebook, What They Don’t Teach You in Pre-License School. You’ll get the straight scoop and make the best business decision for you. New Agents: Do You Need a Coach? What Type? Which of these are good for you? Here’s my advice on coaches. Watch for future blogs on enlisting a mentor, joining a team, or becoming an assistant. I hope your manager will become your accountability coach. But, many managers promise to ‘coach you’. However, that quickly becomes a ‘got a minute’ answer man function instead of a focused, linear, goal-oriented action coaching. You don’t need a coach just for answers. You need a coach to hold you accountable to your goals and action plan. The specific program should be highly organized and precisely out­lined with checklists and systems. Ask, “What system are you going to use to coach me?” You need a specific game plan, because you are new. You have no history.. The coaches should be trained and coached themselves. Ask, “What’s your coaching background, and what sales principles do you believe in?” For example, each of our coaches in the Carla Cross Coaching program has been trained by me and coached regularly by me. Positives: Having a coach keeps you on track, motivated, and, ide­ally, inspired to reach your goals. Watch out for: Your coach is trained and dedicated to your success, and is following a proven game plan (otherwise you’ll be paying just to talk to someone every once in a while). Professional coach: Someone trained to coach, who uses a specific program and who is paid to be your coach. If you’re considering a professional coach, find out the specific program the coach will use to coach you. Get expectations in writing, and give your expectations in writing. You should expect to sign a 3-12 month contract. Manager coach or in-office coach: Someone who may be trained as a coach, who has agreed to coach you. May be paid from your commissions or from a combination of office/your commissions. May be paid on an hourly based by the agent. Be sure this coach is prepared to be your accountability coach, has a specific schedule with you, and a specific start-up plan to coach you. Otherwise, you’re just getting an ‘advice session’. Most peer coaches don’t have a coaching program to coach to, and haven’t been trained. They are also at a loss with what to do if the agent refuses to do the work. In my experience, the new agent has the highest hopes that the peer coach will fulfill his dreams of whatever coaching is to him. The peer coach is hoping the agent just doesn’t ask too many questions! Unfortunately, neither party has defined exactly what the peer coach does. If you’re going to work with a peer coach, get in writing exactly what that peer coach is willing to do with and for you. Bad peer coaching can turn into a nightmare—for both parties. Agents’ advice: Dozens of experienced agents have told me they wish they had started with a professional coach. If you can find one to trust—and to follow—you’ll shorten your learning curve dramatically and easily pay for the coaching fee. Plus, you’ll establish a successful long-term career. In the next blogs, we’ll discuss three ‘safety-nets’ that some new agents consider—because they’re afraid they will not be able to generate enough commissions by relying solely on their own work. Have All the Answers You Need to Make the Best Business Decision for You? If you’re interviewing tons of prospective agents, you’re spending lots of time at it. Why not let Carla answer some of the most important new agent questions–and free you up to do a real interview? Check out my ebook, What They Don’t Teach You in Pre-License School. You’ll save lots of interview time and help the winners choose you!